Tomislav Donchev was born on August 6, 1973 in Gabrovo. He holds a Master’s degree in Philosophy from Veliko Tarnovo Univesity St. Cyril and St. Methodius with a second major in Journalism. In 2006 he received a second Master’s degree from the same University, this time in Business Administration. 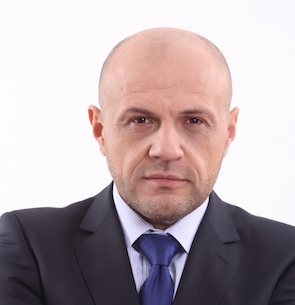 In 1998 Tomislav Donchev completed a training course in Political Science at the International Summer School of Political Science and International Relations in Poland. In 2001 he completed a training course in Support of High-Tech Small and Medium-Sized Enterprises and Research and Development Start-Ups at the Institute in Negev, Israel. In 2005 he completed a course in Business Mentoring at the Academy of Business Mentoring in Oxford, UK. From 1995 to 2000 he worked as a volunteer, member of the management and staff of various NGOs in the field of Education and Science and was also collaborator of a sociological research agency. From 1997 to 1999 he worked as a teacher at St. Cyril and St. Methodius High School of Humanities in the town of Veliko Tarnovo, where he taught psychology, logic, ethics, and philosophy. From 1999 to 2000 he worked as editor at Radio Gabrovo. From 2000 to 2004 he was Executive Director of the High-Technology Business Incubator -Gabrovo, and from 2004 to 2007 he was a program director at the Open Society Institute. In 2007 he was elected mayor of Gabrovo. The main priority in his work as mayor was to attract external funding and develop quality project proposals, through which Gabrovo Municipality became one of the most successful beneficiaries in Bulgaria in terms of management of EU-funded projects in all areas of social and economic life. 21 proposals were prepared in only 2 years. Of them, 19 received funding. In March 2010 he became Minister for Management of EU Funds in the government of Boyko Borissov. From May 2013 to May 2014 was MP from GERB in the 42nd National Assembly. From May to November 2014 he was a Member of the European Parliament from the EPP Group. He was elected Deputy Prime Minister for European Funds and Economic Policies on November 7, 2014, by the 43rd National Assembly. Why is entrepreneurship key to so many aspects of public policy?